Recent release “Sit Down and Shut Up” from Page Publishing author Roger Wong is both innovative and enlightening; this work delves into the real experiences of the author through his years of teaching. 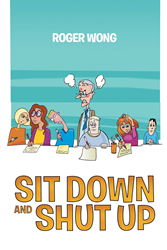 Roger Wong, a retired teacher, Veteran, husband, traveler, avid reader, sports fan, devoted writer and author, has completed his new book “Sit Down and Shut Up”: a raw memoir about life as a teacher and the truth about what happens in a classroom. Published by New York City-based Page Publishing, Roger Wong’s entertaining work is a creatively crafted and vividly illustrated journey into the world of teaching. Innocently stumbling into the field of education at the last minute, Roger Wong discovered teaching had many rewards, and over the years, he developed a visceral love for his chosen occupation. But sometimes, his job did not love him back! Unruly students, arrogant administrators, and even life-threatening classroom situations befell him. Unreasonable, impossible school reforms, racial dilemmas, and an unshakeable fear of failure permeated his semi-illustrious thirty-four-year career. He even endured a classroom full of fourteen-year-olds during a major earthquake! And survived! Yet none of this averted his resolve to equip his students with a quality curriculum or his best effort at terrific teaching. Paranormal classroom happenings? Not a chance. Tuna fish and human hair sandwiches? No way. A bursting bladder? Think again. This book is what teaching in a public classroom is really like, without any excuses or apologies, and without wearing the rosy lenses of societal stereotypes. It’s a frank look inside the mind and classroom of one rather insignificant, average, individual teacher. He struggled to be the best he could be, sometimes succeeding, and sometimes failing in unimaginable fashion. Readers who wish to experience this profound work can purchase“Sit Down and Shut Up” at bookstores everywhere, or online at the Apple iTunes store, Amazon, Google Play or Barnes and Noble.